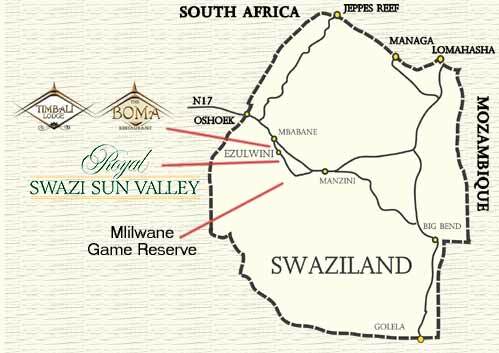 We are centrally located in the Ezulwini Valley between the commercial centres of Mbabane and Manzini 1 km north of The Royal Swazi Sun golf course and casino, craft markets and just a short drive from Mlilwane Game Reserve. Coming from Mbabane, take the Ezulwini exit from the highway & follow the old main road for about 1 km. Turn right and follow the signs. Coming from Manzini, take the Ezulwini exit from the highway. When you get to the T-junction turn left and then immediately right (about 10m) and follow the signs.